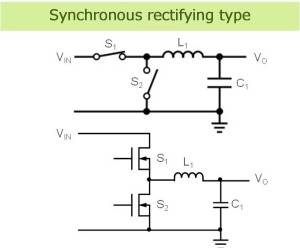 As was explained in the preceding section, among the DC/DC converters the non-isolated buck switching regulator comprises two topologies: nonsynchronous rectifying (diode) type and synchronous rectifying type. 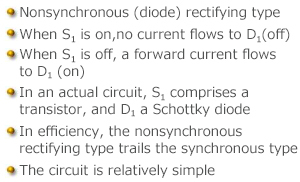 The nonsynchronous rectifying type, which has been in use for years, features a simple circuit for a switching regulator, with an efficiency barely topping 80%. Subsequently, the appearance of battery-powered applications drawing relatively large power and requiring high efficiency, such as notebook PCs, has led to the development of a succession of ICs for synchronous rectifying switching regulators capable of delivering superior efficiency. Aided by innovations that have facilitated the design of the synchronous rectifying type requiring complex control and circuitry, this type of switching regulator, offering a maximum efficiency close to 95%, has gradually become predominant. Figures 39 and 40 show an overview of the two topologies and illustrate the way they operate. 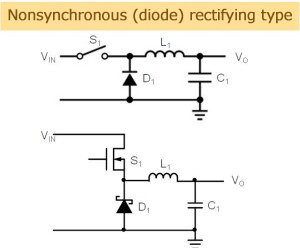 As shown in the figure, the difference lies in the fact that whereas in the nonsynchronous rectifying type, the low side switch is composed of a diode, in the synchronous rectifying type, as same as the S1, the switch is a transistor. In the nonsynchronous type, the current flow to the diode is controlled by on-off action of the high side transistor, as was explained in the previous section. In the synchronous type, based on the same operation, the on/off action of the low side switch is also performed by the control circuit. When both the high and low side switches turn on simultaneously, a current flows directly from VIN to GND. Prevention of the occurrence of this condition requires complex control, such as creating what is called dead time in which both switches are off. 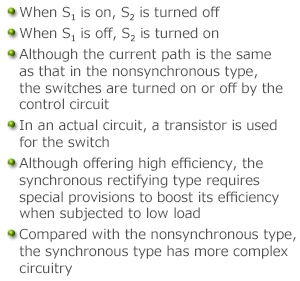 Despite this fact, the reason that the synchronous rectifying type achieves higher efficiency than the nonsynchronous type is that a transistor (especially a MOSFET) is used for the low side switch, substantially eliminating the loss generated by a diode and permitting optimal timing control. The following presents a little more explanation of the losses and efficiencies of the two topologies. In either circuit, because a current flows through the switch, there is a loss associated with the switch, which affects the efficiency. Diode loss is attributable to the forward voltage VF; transistor loss is ascribable to the saturation voltage or the on-resistance. The VF of the diode increases as a function of current. Even in the case of a Schottky diode, known for a low VF value, the level of VF at 1A reaches 0.3 to 0.5V. By contrast, the on-resistance of the Nch-MOSFET, for example, is extremely low at 50 mΩ. When the attendant decline in voltage is taken into consideration, it is 50mV at 1A, significantly lower than the VF value of the diode. 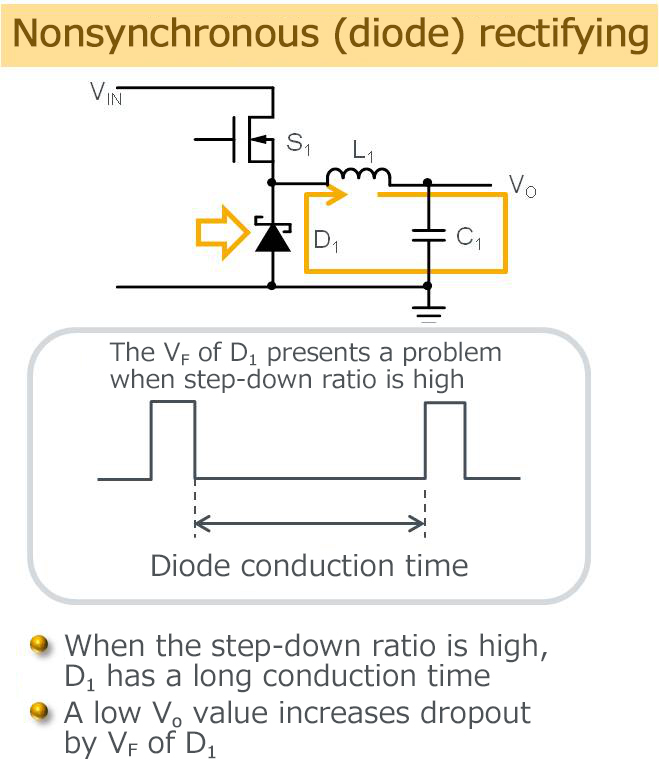 In particular, when a high step down ratio is used to step down from 12V to 1.5V, the on-time for the low side switch becomes longer, representing as much as 90% of the cycle time. With the nonsynchronous rectifying type in which the low side switch is a diode, during the 90% period the operation produces loss amounting to VF. This represents a 0.5V loss relative to a 1.5V output, with a substantial adverse impact on efficiency (see Figure 41). Another significant difference is the behavior of the regulator with light load. 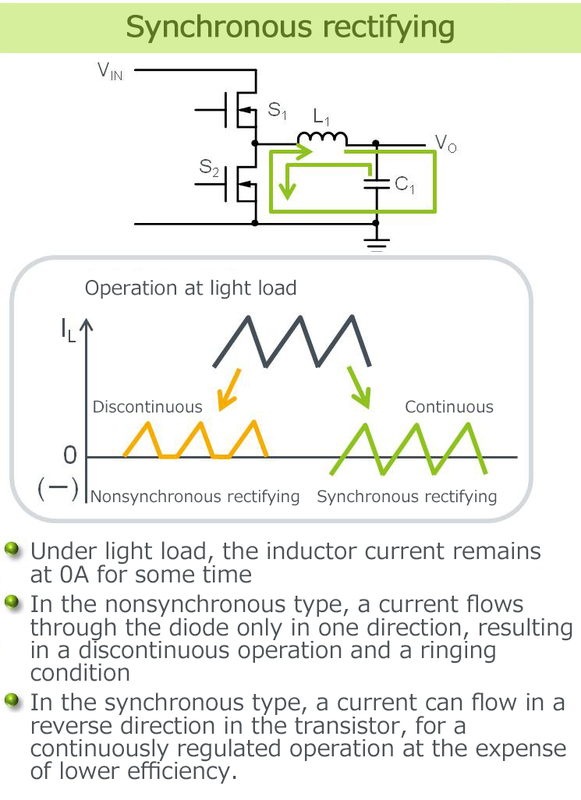 In Figure 42, the orange and green arrows represent inductor currents under light load, for the nonsynchronous rectifying type (orange) and synchronous rectifying type (green). As shown in the figure, the inductor current describes triangular waves due to switching actions. When the load current declines to a significant extent, the inductor current falls to the level where it crosses the zero point. In this state, the nonsynchronous type using a diode, because it can cause a current to flow only in one direction, the current entering the negative region, indicated by an orange-color waveform, disappears, and the current waveform assumes a stop-and-go state with zero periods. This condition is referred to as a discontinuous mode. By contrast, since it is a transistor, the synchronous type is capable of creating reverse flows, such that the current in the negative region continues. This condition is called a continuous mode. The continuous mode produces ringing in the switching voltage, generating harmonic noise. The synchronous type sustains regulated operations by maintaining a continuous inductor current, albeit some decline in efficiency due to the fact that the reverse current flows are supplied from the output capacitor. In terms of overall strategy, an appropriate type must be selected by evaluating such factors as the complexity of the circuit, costs, efficiency, and tradeoffs with harmonic noise stemming from the ringing effect.